This 21st Century multi offers the vitamins and essential minerals bio-transformed into food form for high bio-availability. Higher doses are unnecessary, as True Food nutrients are more potent than standard vitamins and minerals. Gently pre-digested with natural enzymes. As a guide, the nutrients in Supernutrition Plus are 2-8 times more bio-available than standard isolated vitamins and minerals. True Food Supernutrition Plus is gently pre-digested with natural enzymes before tableting, making sensitivity reactions unlikely. Unfortunately it`s a sad fact that most people do not get all the nutritional needs from the food they eat. With modern `fast food`, no time to cook or design a diet rich in essential nutrients or just a desire to lead a healthy life, there`s always a good reason to ensure that your body gets what it needs to maintain and support good health. Proprietary mixture: magnesium chloride, ascorbic acid, zinc sulphate, sodium molybdate, copper sulphate, ferrous fumarate, boric acid, silicon dioxide, niacinamide, chromium chloride, manganese chloride, biotin, d-alpha tocopherol (wheat germ oil [gluten]), calcium pantothenate, citrus bioflavonoids, folic acid, riboflavin, potassium iodide, pyridoxine HCI, phytonadione, thiamine HCI, viatmin D2, cyanocobalamin, with enzyme digested S.cerevisiae (with soya); beta carotene, selenium enriched enzyme digested S.cerevisiae (with soya); natural Lithothamnion calcarea, bulking agent: microcrystalline cellulose; anti-caking agent: magnesium stearate*; coating: methylcellulose, glycerine, natural vannila flavour (agave syrup; flavour: vanilla extract` colour: caramel); anti-caking agent: silicon dioxide; emulsifier: sodium carbomethyl glucoside. Adults: Take 2 - 3 tablets a day, with or between meals. Children over 8 years: Take 1 - 2 tablets a day, with or between meals. Below are reviews of True Food Supernutrition Plus - 180 Tablets by bodykind customers. If you have tried this product we'd love to hear what you think so please leave a review. True Food Supernutrition Plus is a great product. Question about True Food Supernutrition Plus - 180 Tablets Are the True Food supplements suitable for those with an intolerance to yeast? 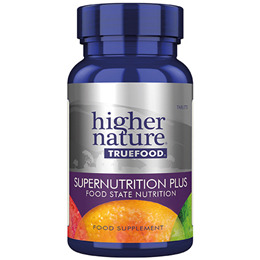 Question about True Food Supernutrition Plus - 180 Tablets Are the nutrients in the True Food range synthetic? Question about True Food Supernutrition Plus - 180 Tablets Is this product yeast free? The True Food Supernutrition Plus is "grown" and complexed on a yeast culture so we cannot say that it is yeast-free. At the end of the process, however, the long protein chains in the yeast are broken down and it is these long chains that generally trigger allergic reactions or yeast problems. Question about True Food Supernutrition Plus - 90 Tablets Are the True Food supplements suitable for those with an intolerance to yeast? Question about True Food Supernutrition Plus - 90 Tablets Are the nutrients in the True Food range synthetic? Question about True Food Supernutrition Plus - 90 Tablets Is this product yeast free? Question about True Food Supernutrition Plus - 30 Tablets Are the True Food supplements suitable for those with an intolerance to yeast? Question about True Food Supernutrition Plus - 30 Tablets Are the nutrients in the True Food range synthetic? Question about True Food Supernutrition Plus - 30 Tablets Is this product yeast free? 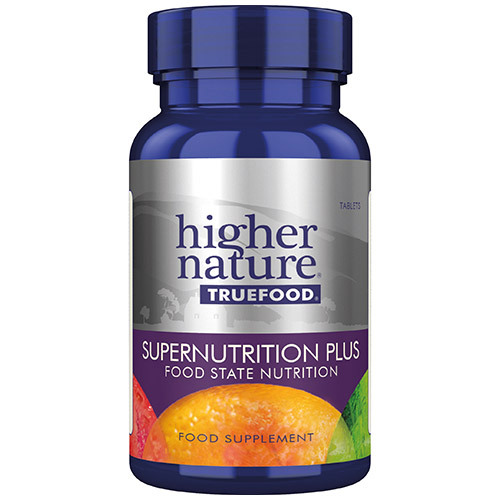 Higher Nature True Food Supernutrition Plus offers essential vitamins and minerals in a food-based formula for high bioavailability. Higher doses are unnecessary, as True Food nutrients are more potent than standard vitamins and minerals.